Join us for free, live webinars! RedTreehouse.org webinars feature topics suggested by our users and are presented by experts in the field. In developing the sessions, we focus on answering frequently asked questions and incorporating audience engagement. Can't make the live webinar date and time? Live webinars are also recorded and made available for viewing on the RedTreehouse.org site. Kwame Christian, Esq., M.A. 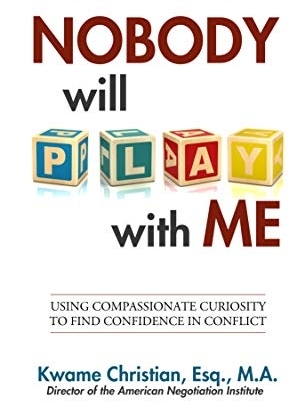 is an attorney, mediator, and author of the new book, Nobody will Play with Me. When he’s not traveling the country teaching professionals the art of negotiation and conflict management, he loves spending time with his wife, Dr. Whitney Christian, and son, Kai Christian. Kwame Christian, Esq., M.A. is a business lawyer and the Director of the American Negotiation Institute where he conducts workshops designed to make difficult conversations easier. As an attorney and mediator with a Bachelors of Arts in Psychology, a Master of Public Policy, and a law degree, Kwame brings a unique multidisciplinary approach to the topic of conflict management and negotiation. His TEDx Talk, Finding Confidence in Conflict, was viewed over 24,000 times in 24 hours and was the most popular TED Talk on the topic of conflict of 2017. He also hosts the top negotiation podcast in the country, Negotiate Anything. The show has been downloaded over 400,000 times and has listeners in 181 different countries. To learn more about Kwame’s workshops, view this short video. Negotiate with yourself in order to gain control over your emotions and understand what you really want and why you want it. Consistently put yourself in the best position for success. Defuse potentially explosive conflicts before the conversation breaks down. Use the fundamental tenets of cognitive behavioral therapy to help you to overcome fear and anxiety. Use conflict as a tool to increase understanding and strengthen relationships. How to approach every interaction as a strategic opportunity for future success. Kathryn Bryan, Ph.D. received her M.A. and Ph.D. from Kent State University in behavioral neuroscience. After spending several years as a postdoctoral research fellow at the Cleveland Clinic, Case Western Reserve University, and the Cleveland VA Medical Center, Katy decided to make a career change. Skylight Financial Group was the beneficiary of this when she decided to become a financial planner. She has served on the boards of Medina Creative Housing, the Renee Jones Empowerment Center, and A Place for Us. In addition, she is currently on the Executive Board for the Benjamin Rose Institute on Aging and Connecting for Kids. Financial Strategies for Families with Special Needs: What's in Your Toolbox? Join the Skylight Financial Group Special Needs Planning Team for a free educational webinar for families and individuals with special needs. Learn how a financial professional can serve as the manager/coordinator in the planning process and help you to prepare for the financial well-being of your loved ones. Topics will include letters of intent, government benefits, tax tips, life care planning and more. Sample scenarios will be provided, and attendees will be able to ask questions and engage through online polls during the webinar. Blaine P. Brockman, Esq., is an attorney with Hickman & Lowder Co. LPA and manages the office in Dublin, OH. He focuses his practice on special needs estate planning, special education, elder law, public benefits, probate, and guardianship. Brockman is a member of the Academy of Special Needs Planners and the National Academy of Elder Law Attorneys. He served for 12 years on the Madison County Board of Developmental Disabilities and is on the boards of the ARC, Community Housing Network, Advocacy and Protective Services Inc., and Creative Housing. He received his J.D. from Capital University Law School with honors. Public benefit asset and income limits make living a good life difficult. Eligibility for important special needs benefits such as Medicaid and SSI is at risk if you earn or have savings above these limits. Join us to learn about planning techniques (trusts, ABLE accounts and more) used to help preserve assets and eligibility, allowing you or your loved one to live a full and enriched life. How can working people handle the income limits? How can money from an inheritance or a settlement be protected? Are there plans allowing for long term savings for individuals with disabilities? What are the different types of SSA benefits (SSI and SSDI) based on disability? What is a Medicaid Waiver? Do I need a special needs trust? How is that different from an ABLE account? Postponed - new date coming soon! Continue the conversation with Blaine Brockman! As a follow-up to the Special Needs Planning: Making a Good Life Possible webinar, Attorney Brockman will address questions from participants on topics covered in his April presentation. Attendees of this Q & A session are encouraged to watch the recorded Special Needs Planning: Making a Good Life Possible webinar, available on this website, prior to participating.